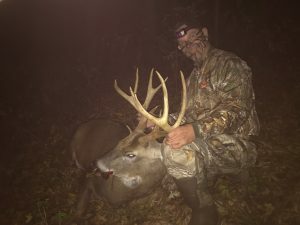 Scott Jackovich’s Archery 2018 Harvest Using Pollick’s Flaming Doe! Quality doe in heat deer urine collected during the peak of the estrus cycle. 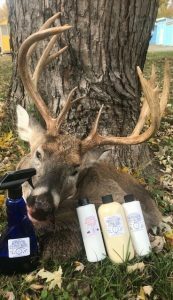 This product also contains extracted vaginal scent which really spikes the interest of bucks shortly before and throughout the entire mating season. 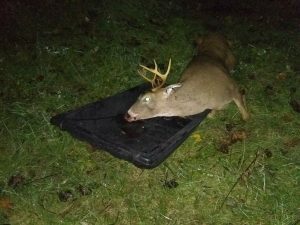 Use as a scrape additive or to lay a hot doe trail to your stand. First morning using your flaming doe scent and this buck came running in after 30 minutes in the stand! 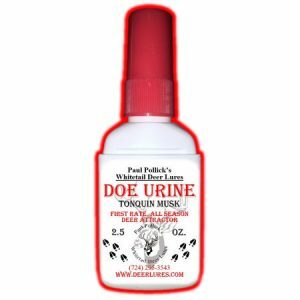 I am very fussy about deer lure because the deer where I hunt (mountainous steep country areas) the deer don’t respond favorably to it. They seem to know something is wrong. On 10-29-2018 i used your flaming doe deer urine to lay a trail between scrapes into a really nasty thick mess of briars, locust and multifloras rose on a ridge where i see sporadic buck sign. 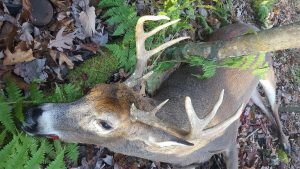 these deer get heavy rifle, muzzleloader grouse hunting pressure. 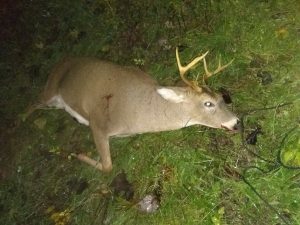 Short story, a nice Armstrong County PA buck walked right into me, nose to ground and never knew i was there until i shot him at 7 yards. Many have busted me over the past couple of years. This one didn’t care about anything but the scent. Haven’t had results like this from a scent since the 80’s. As i said before, these deer are high pressured, not tolerable of humans, and are not curious by nature of where they live. Your scent is different. it doesn’t stink and i felt it would be different and thats why i tried it. Glad i did!!!!! Thanks Paul……finally, a great product I believe to be a useful hunting tool. Thank You Paul! I have a picture of the deer, but not of me with it. I know that sounds strange. 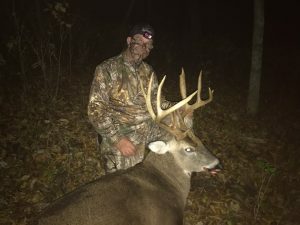 I donated the deer to a friend who enjoys venison. I gave the antlers to her 5 year old son as I just don’t keep them anymore and he is thrilled to have them. I don’t take a lot of pictures in general and even fewer of me with game as I am usually by myself. 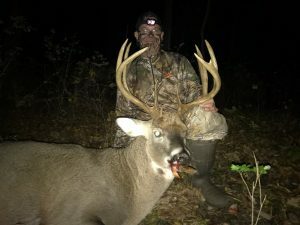 Put simply, The deer I wind up hunting are usually not “hunting show” caliber racks and the pictures I do take are usually just for my own remembrance and to share sometimes. 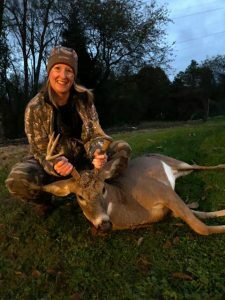 To explain, I hunt almost exclusively public ground and do not depend on any land management, gimmicks, baiting, or posted private areas for hunting. 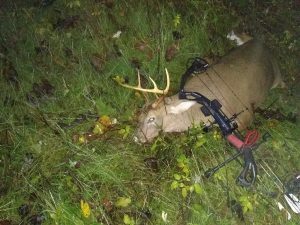 Most people do not want to hunt this way anymore because the success with a bow is so unstable and its downright stingy with deer sightings usually. But its real fair chase, wide open hunting to me and these are real animals, not manufactured for television. These are “woods deer” anyone could go after, but the animals, pressure, access, terrain and food sources are unforgiving, and it discourages most people from being interested. Including me more times than I’d like to admit! 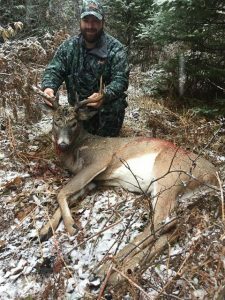 Given the above circumstances, I earn everyone of these deer, antlered, or antlerless, and to put down a nice thick healthy buck like this isn’t simple anymore. Scents, to me, have always been a totally acceptable tool to help outsmart basically nocturnal, high pressured deer. Problem is, none of them usually work worth a hoot. Your product being the exception. It brought this buck in totally relaxed and distracted. Just why I need a good scent. Here are pictures of the deer. You may use any you wish. You may use my testimonial, or excerpts of my testimony, as well. Happy to help you. I would like to try the “Doe Urine Tarsal plus” you’ve so kindly offered. Thanks again for making such a great product. I’m confident in it!!!! I was off work and wanted to go hunting but I couldn’t find my husbands buck lure. I went to Ultimate Outdoors in Plum and they told me about your Doe estrus so I purchased it. As soon as I got in the woods I hung up the scent wick and got into my stand. The wind was blowing away from the direction this buck came from, but once he crossed into the scent it stopped him and held his attention so I could take the shot. I will definitely be using your products. Paul, I have been using your deer lures for almost 20 years with much success. Thanks for the Flaming Doe you recommended last week. Put an arrow through this buck at 35 yards courtesy of your Flaming Doe. At any rate, I wanted to send you these photos of my first bow harvest this hunting season. It was the last day of Pennsylvania bow season and all the conditions were perfect for a good last day. The morning of the harvest and prior to climbing into my stand i used 4 or 5 drops of your Flaming Doe in a small mock scrape. I hastily made on an old logging road within 25 yards of my stand. Low and behold at 11:30 in the morning this buck made his way by my stand looking for the hot doe who’s fragrance he had caught in the air, needless to say he caught a rage broadhead instead of the doe. I can’t thank you enough for an awesome product. 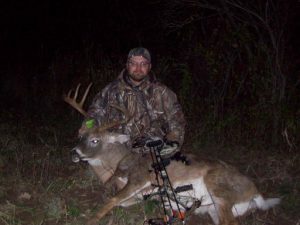 Along with your product and my persistence to stay in the woods, I was able to harvest my first whitetail with a bow! Thanks for the great scents. 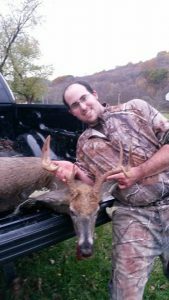 I shot this guy on 10/22/14 in Westmoreland county using your Flaming Doe scent in a scent bomb. He came in and offered me a 15 yd shot! Last year on Oct. 22 I decided to hunt the edge of a bean field so on my way to my stand I decided to drag a scent line of your flaming doe. He came in nose to the ground and when he stopped at the tree I hung the drag in, I made the 30 yard shot count! He piled up about 70 yards away, right on the edge of the beans! 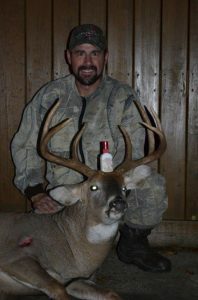 He is a real nice 9pt. that scored 126″ and field dressed at 195#. Chippewa Co. Wisconsin.